The Maori explanation for New Zealand’s volcanic activity is that a priest from the first canoe fought a monster and locked it beneath the earth. That volcanic activity has defined a great deal of local geography and history. White Island is an important part of that, being the only active marine volcano in New Zealand. The Island sits 50km off the East coast; a distance which took our little convoy of two helicopters only 20 minutes to traverse. The Island is constantly shrouded in steam rising from the caldera, its blasted landscape a combination of grey, white and yellow. We circled the Island and then landed on a rocky plain amid the wafting smells of sulphur. And then we set off to get really close to the dangerous bits – it was hard to forget the words on the disclaimer we’d signed earlier warning of the dangers of flying and landing on an active volcano. Walking on White Island is like walking on the moon. Virtually no vegetation survives the harsh acidic environment inside the crater walls. Instead, lush beds of yellow and white sulphur crystals grow amongst hissing, steaming, bubbling fumaroles. White Island was for many years used to mine sulphur and it’s easy to see why. Spills of yellow are everywhere amongst the steam. The gases are so strong that we had to wear gas masks for much of our visit. And, yes, we did sound like Darth Vader. 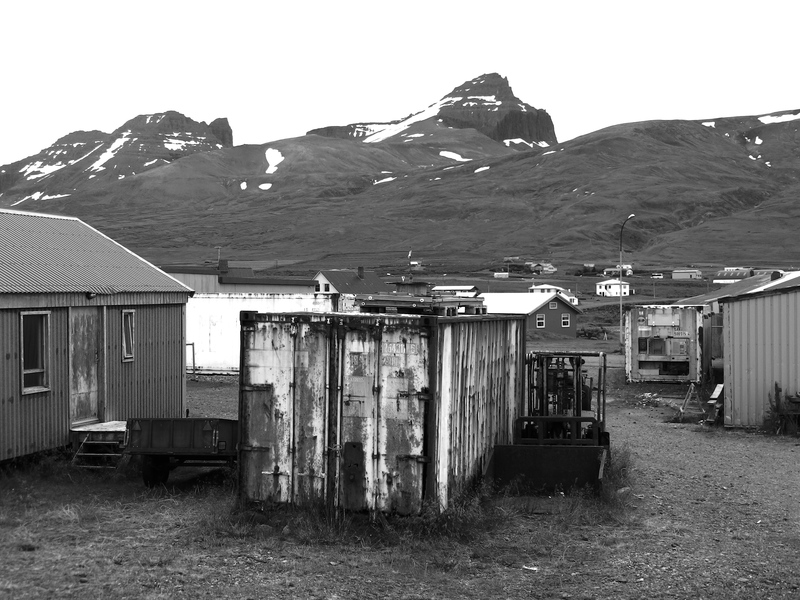 We had the whole island to ourselves which really drove home the isolation and the foreignness of the whole environment. Water bubbled from the ground; gases spurted upwards; mud exploded up through the steam in enormous , noxious ejaculations. We were all grinning through the experience; although you couldn’t see that because of the gas masks. The other fascinating thing about the island was the decaying industrial machinery left over from the days of sulphur mining. The highly acidic fumes are rapidly eating away at the huge tanks, gears and walls. The metal surfaces in particular have become beautiful as they are deeply pitted and rusted. I don’t know if the Maori ever made it to White Island, but later in the day, the Rotorua Museum gave us an insight into Maori culture both past and present. The whole original story of the canoe trips to New Zealand are remarkably well-preserved in an oral tradition. It was all too easy to draw a contrast with our GPS-guided helicopter trip of the morning. The museum also included a great presentation on the Maori battalion in WW2. There was also a fascinating story on the pink terraces which was made more personal because a member of Jennifer’s family had photographed them before their destruction. White Island, by the way, was formed when the Maori priest who trapped the monster was rescued by his sisters. When they popped up to get their bearings after crossing the Pacific, they burst into flames and White Island was created. While the Museum was pretty interesting, it was really the Skyline luge that was the other bookend to our day. Up the mountain in a gondola; a high-speed, adrenaline-fuelled luge down the mountain and then ski-lift back up to do it all again. Honestly in my view the whole process should have carried far more of a danger warning than visiting the live volcano did this morning. And we didn’t even get gas masks. 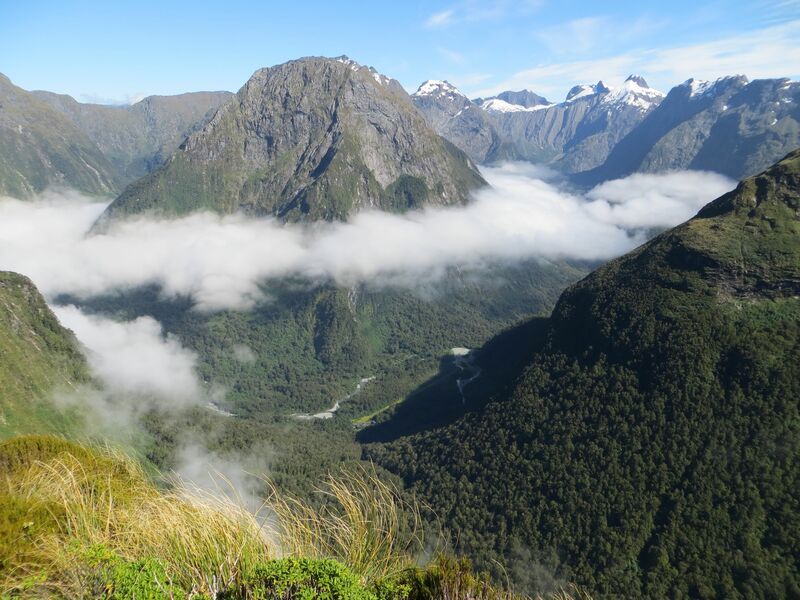 McKinnon Pass, that notoriously awful crossing between the surrounding peaks, turned out to be a beautiful and relatively easy trip thanks to our great good fortune with the weather. The day involves a 16km walk and going about 700m up and another 900m down in the course of a few hours. The walk is relatively tiring because of all the going up and down but on a day with bad weather it can be a real feat of endurance. For us the sun shone and the views were absolutely spectacular. As we zig-zagged our way up the mountainside each turn brought a new vista. The path itself was less well-formed than yesterday and had been further ravaged by erosion and rockfalls. In spite of that Declan set a killing pace and we made it to the top of the pass in amazing time. As we surmounted the top of the pass we were met by a guide with hot chocolate and by keas with incredibly sharp beaks. The keas and very clever birds, like pickpockets they often work in packs with one distracting you while the others attack your stuff. Nothing really stops them, they can rip into packs, punch through boots, tear up walking poles. In spite of that they have a lovely green plumage with a flash of orange on the underside and if you stay vigilant they are great to watch. The view from the top of the pass was totally worth the climb. On the far side we could look down on a perfect conical peak ringed at about half its height by a crown of cloud. It was a dizzying and completely stunning spectacle. After lunch we started downhill. The rough path and stream crossings were tough on the legs but the weather and views made it more than worthwhile. At about the 15km mark there was a wonderful series of cascades to provide air conditioning as we walked. In spite of the cooling spray the last part of the walk was hard in the way that last parts often are. But there’s no question we were astoundingly luckily in our crossing of McKinnon Pass. The path to the Pass. Ever upwards to McKinnon Pass. 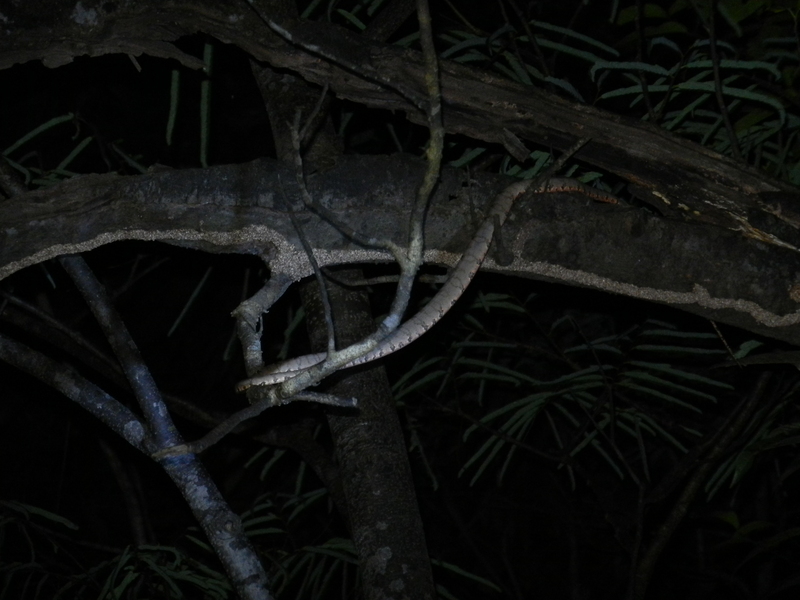 Fer-de-lance snake in the tree. Last night when Declan and I went spotlighting on the river the jungle was a dark lowering place. The trees were pitch-black walls, the clouded sky a dark grey and the river itself a fustian path leading ever onwards. The sounds of monkeys, birds and frogs seemed almost alarmingly close. Finding a fer-de-lance, the most poisonous snake in South America, came with heightened tension and then seeing the eldritch glow of a single firefly bobbing erratically over the river seemed like something other-worldly. Today the river was quite a different place. Bright blue skies saw the sun burning down as we headed up a tributary to the valley of the poison-dart frogs – a name which ought to be capitalised and used as the title of a TinTin book. It took us about two hours of constant motoring through the jungle until we reached our landing-place. And then we set out into the jungle. 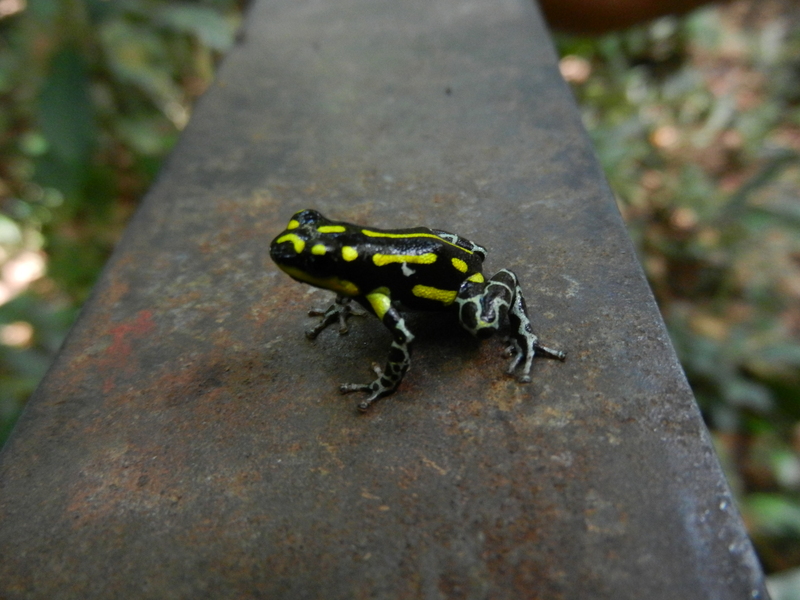 Poison-dart frog on a machette. For the next three hours we walked through oppressively thick jungle to the rhythmic metallic-ringing sound of machetes clearing a path. The humidity was like a thick wet blanket and within minutes we were all dripping with sweat. I don’t think I’ve ever been anywhere that felt so far from civilisation; there was just our small group and thick, unending jungle around us. Insects from tiny little flies to dragonflies the size of small birds droned all around us; there were probably birds too, but the jungle was too dense to see anything more than a few feet away from where we were standing. Termites are a natural mosquito repellent. Our goal was to find the tiny poison-dart frogs. The natives have traditionally used the toxic excretions of these little amphibians to coat their blow-gun darts. 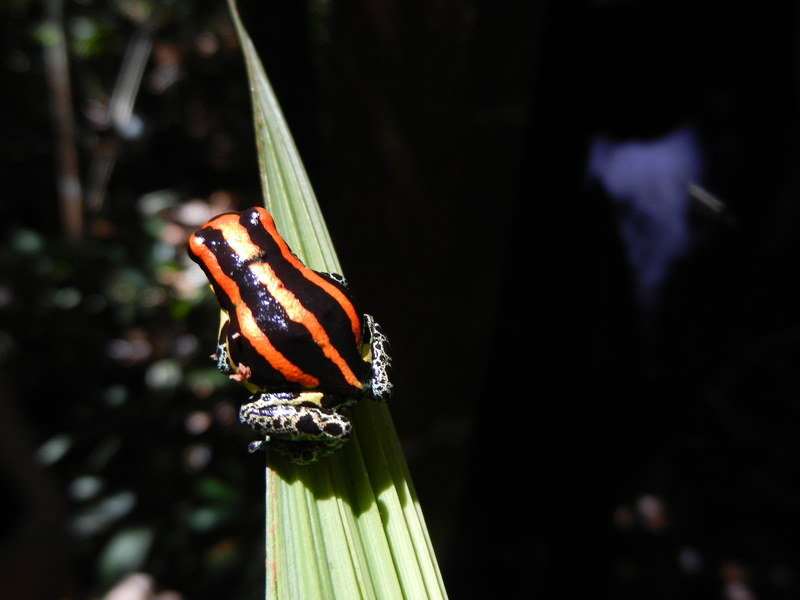 In keeping with much of the jungle flora and fauna the frogs are handily colour coded to indicate to predators they they are dangerous – and that colour coding makes them look rather glamorous to our non-native eyes. We found a yellow and black stripped frog within ten minutes of starting out, but it was a couple of hours until we next found a frog, this one a red-stripped one. In the meantime we discovered a couple of small toads and a huge mahogany tree. There aren’t many mahogany trees left in this part of the Amazon – loggers used to use helicopters to find those sticking their head above the canopy and then cherry-pick them out. Finally we literally staggered out of the jungle into the small clearing where we had lunch by the river. There was a table and some shade and flocks of moths and butterflies attracted either by the shade or the salt from the sweat drying all over us. We all had moths and butterflies land all over us and add the fluttering of their wings to the gentle river-breeze that helped to, eventually, cool us down. 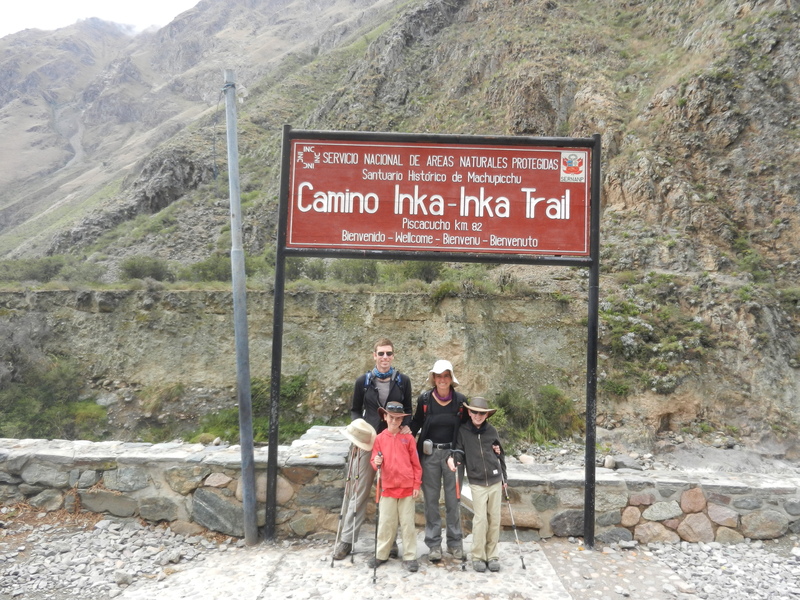 The Start of the Inca Trail to Machu Picchu. 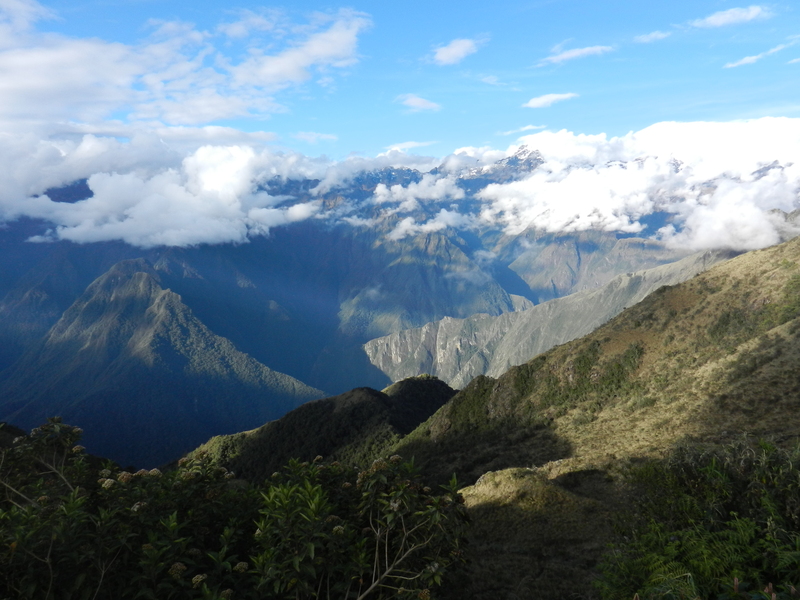 The Inca Trail was a stupendous experience; absolutely brilliant. The boys managed the walk without a murmur of complaint. Declan wasn’t fazed by even the toughest parts of the Trail; Callum found some bits hard-going but gritted his teeth and dealt with them. 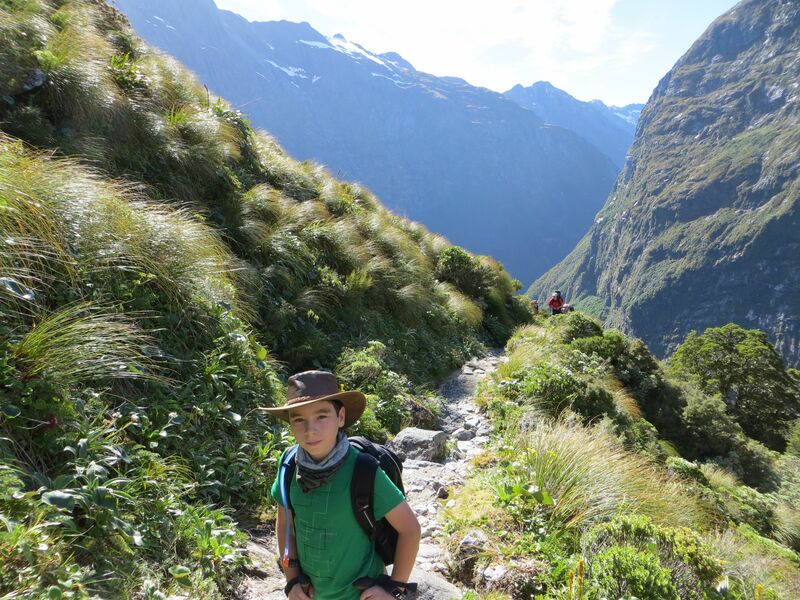 The boys actually handled the highest point, Dead Woman’s Pass at over 4,200m, better than Jennifer or me. The walk itself is lovely. I wasn’t prepared for it being so sub-tropical – filled with lush flora and exotic fauna. Cacti, orchids and bromeliads were everywhere. We saw humming birds and butterflies attracted by all the flowers. Llamas blocked the trail every now and again. At the higher points, birds of prey flew past at eye-level. And as a backdrop there were huge, towering mountains which even the daily clouds, mist and rain could not entirely hide. The Incan ruins were fascinating. While Machu Picchu is just amazing and absorbing many of the smaller ruins were more atmospheric as we had them to ourselves. One of the things we found particularly interesting was that all the buildings were civil engineering works. in contrast to everywhere else we’ve been, the remaining stoneworks are farms and monasteries not castles or fortresses. 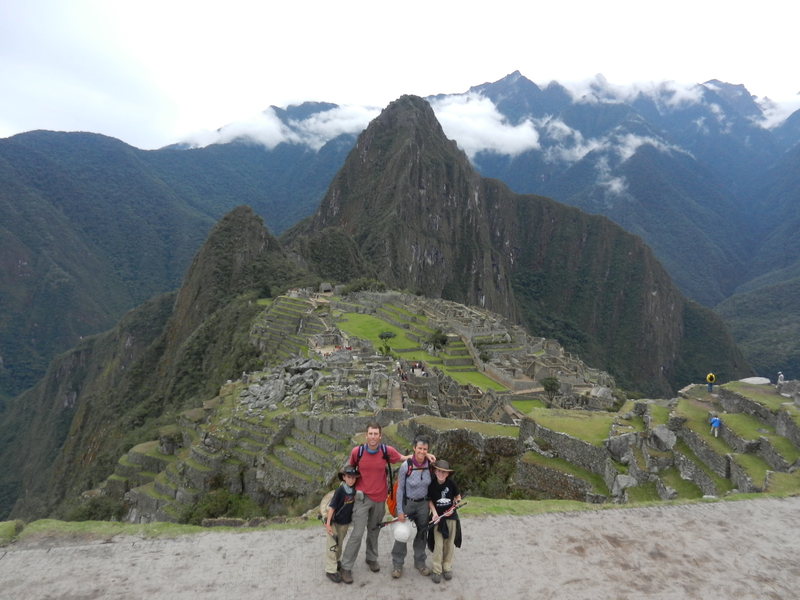 At the end of the Inca Trail at Machu Picchu. We had a great guide on the tour, Alex Fuentes Quino, who bought what we saw to life. And food? The food was just great – three course meals of local foods cooked on a two-ring burner and with better results than you’d get in many restaurants. This was not camping on a shoestring – we had a team of eight porters carrying all of the equipment used by our team. But that said, there was no way we could have managed the tough parts of the Trail if we’d been carrying proper camping equipment ourselves, let alone carrying for the kids too. 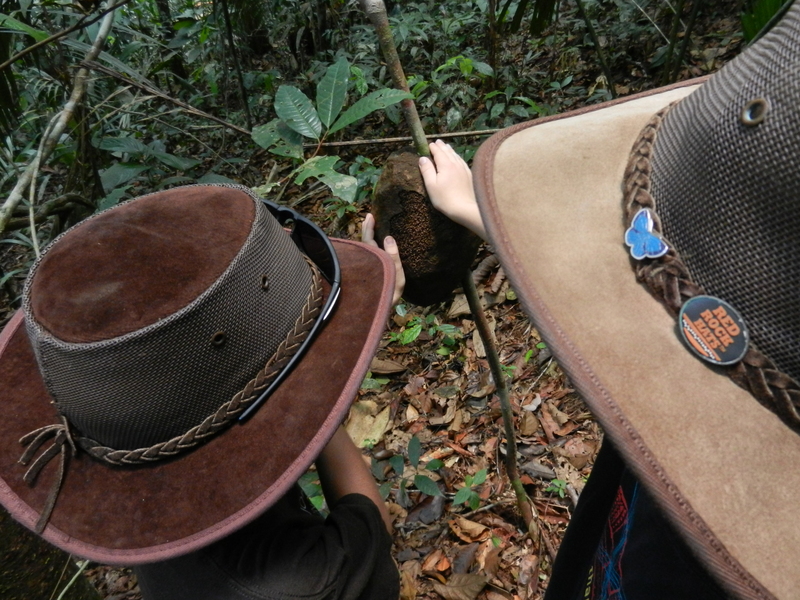 All in all, we had such a great time and have a wonderful sense of achievement in having completed the Trail – especially the boys at 8 and 10. After the toughest day dealing with Dead Woman’s Pass in the rain, the porters from other groups came up to shake the boys’ hands. We’re chuffed to have had such a great experience, but even more so to be able to walk away with the boys having dealt with a real challenge with such aplomb. Highest Point on the Trail. 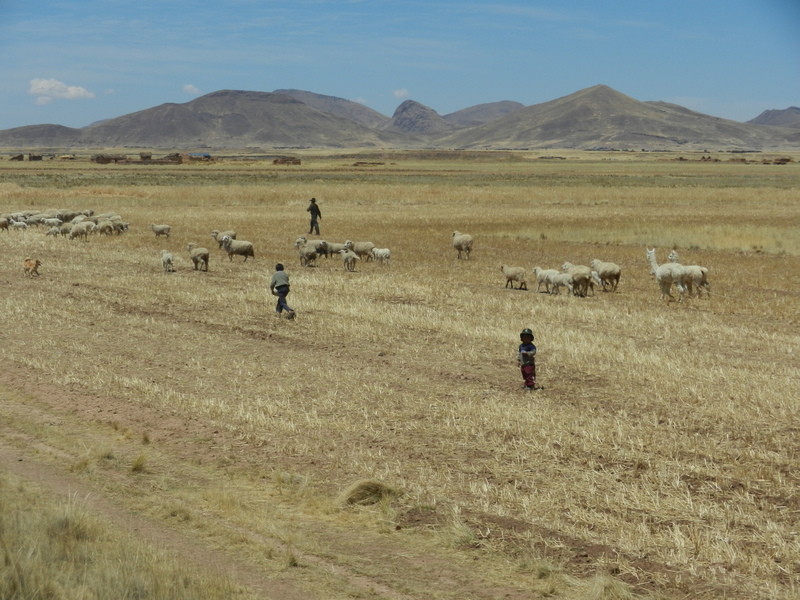 A little girl wearing a bright yellow jumper runs after her brothers as they herd the family’s sheep and alpaca over the flat plain of the Altiplanno. Suddenly the still and calm is shattered by the blaring air horn of a train. A bright blue train of five cars snakes its way towards the family. The sheep are spooked and start to run along the track. The girl can’t quite keep up with her brothers as they chase the sheep and lags behind to get her breath as the train passes. She slows to a walk and raises an arm to wave to the two boys standing on the open observation car at the back of the train. Riding on the Andean Explorer is not so much about getting from Puno to Cusco, it’s an adventure in itself. And what an adventure – we kept on expecting Hercule Poirot or Phileas Fogg to stroll out and join us. At the back of the train. The day began for us with a little more excitement than we were seeking when there was a car accident in front of us as we got to the tiny train station in Puno. The young man hit by the car must have had a glass bottle in his pocket which cut his leg, there was blood everywhere. Luckily he was with two friends who finally managed to force a taxi to stop – after most refused. They then bundled their, now unconscious, friend into the boot; piled into the back and set off into the distance. That really drove home to us how different Peru is to home. 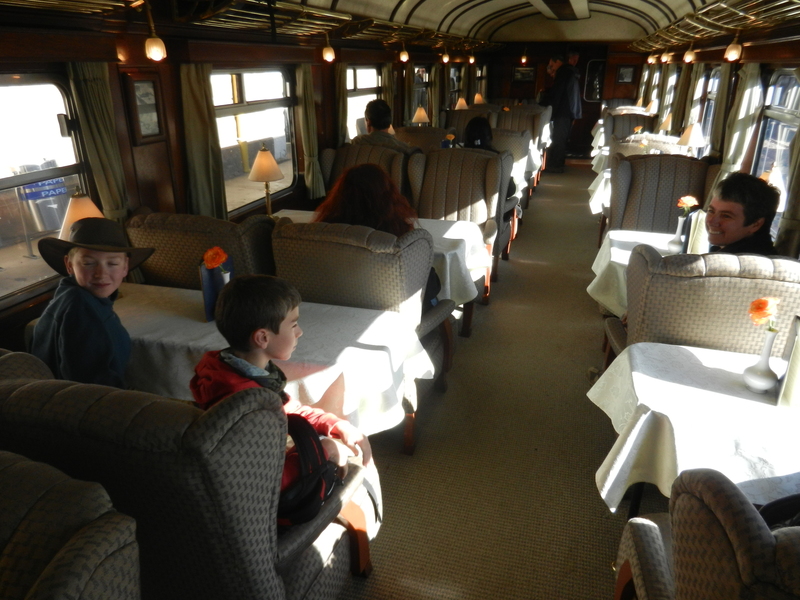 Anyway, the Andean Explorer is an old-style train, like something out of an Agatha Christie book . There are only five cars and the last one is half-bar, half-observation car with an open back. Our seats are armchairs around a table covered in a thick cloth and with a little table lamp. This is not normal rail travel in any way. The trip from Puno to Cusco takes ten hours by train. It’s faster by road, and much cheaper, but a different sort of experience. 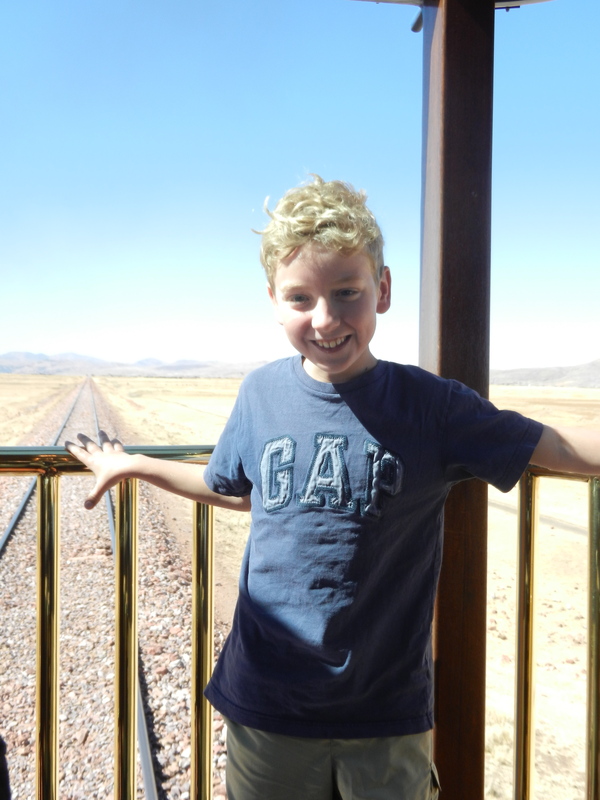 The train seems to average about 30km an hour, which makes seeing what we are passing really easy and enjoyable – especially from the open observation car. As we pass through small towns kids run after the train begging for money, able to keep up for a short stretch. In the towns we pass through markets with tiny stalls set out along the tracks; in fact they are on the track until the approaching train whistles to warn people to clear the way. Everything from tools, to car parts to mummified llamas is on display. We pass over the Altiplano. There are tiny farms, small flocks of sheep or alpacas being watched over by solitary shepherds or sometimes a group of kids. The houses are small, thatched and made of mud-bricks. 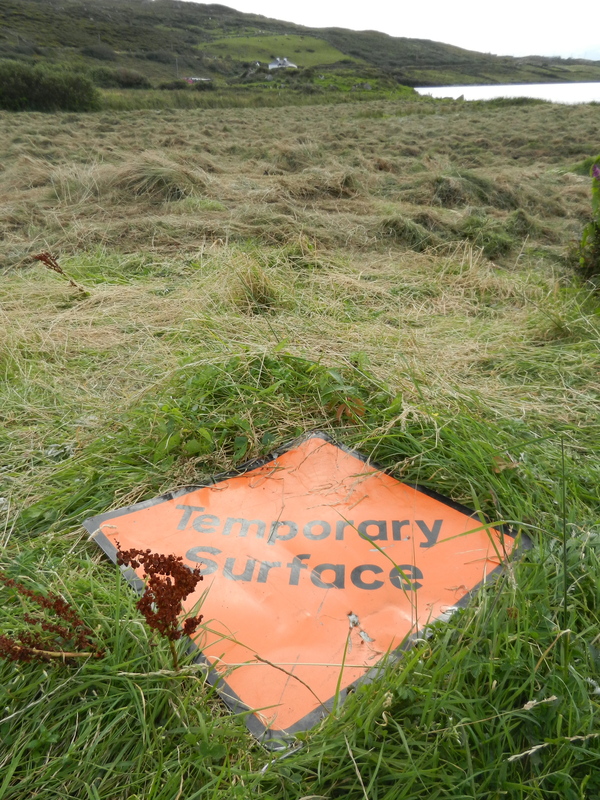 And everywhere is a yellowed scrubby grass. On the train the contrast couldn’t be higher. We sit sipping Pisco sours as the world goes by, then are served a wonderful three-course lunch at our table by liveried waiters. It’s all so over the top it makes us laugh aloud. We stop at the highest point on the route from Puno to Cusco after about five hours travelling and get out to stretch our legs. At over 4300m it’s the highest point we’ll reach on the trip. Almost immediately as we start to descend the farmland becomes richer. There are green fields, the houses have corrugated iron roofs and the townships get bigger. This now against the backdrop of snow-covered peaks looming another couple of thousand metres above us. The land is richer but the people still have a tough life, we see field after field with entire families in them ploughing and planting by hand, the wooden plough being dragged along by a cow. The land moves from flat plain to deeply riven gullies and valleys. The marks left by the rainy season here are abundant and apparent. Whole hillsides are nothing more than scars from landslides. Instead of scrubland there are now trees about and everywhere you look there are cacti. 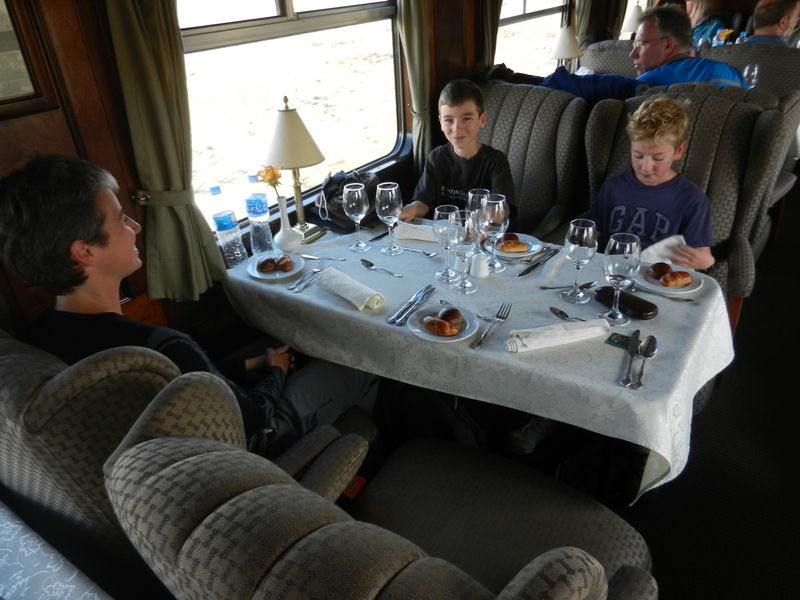 We have afternoon tea as the train rolls along beside a river that drops away beside us into a deep gorge. Eventually ten hours after leaving Puno we roll into Cusco after what we all agree has been a truly special rail journey. Greener lands on the way down to Cusco. Highest point on the trip. 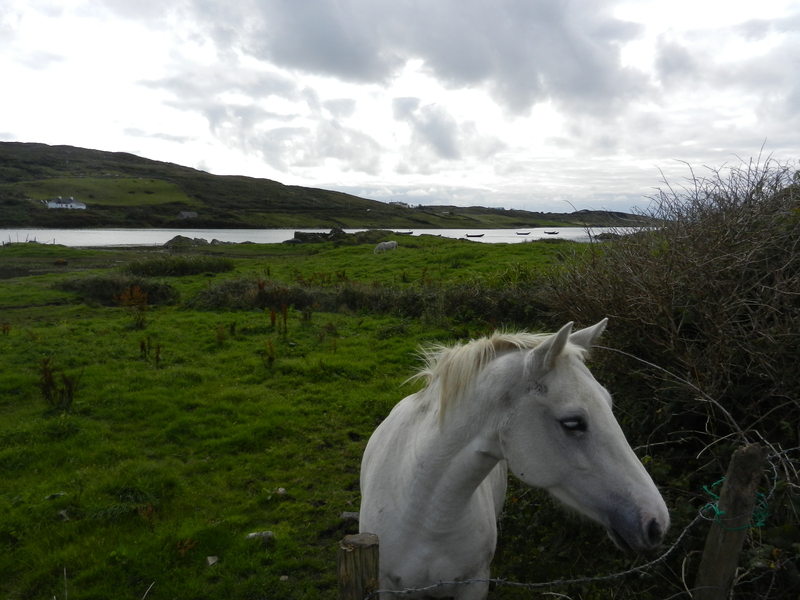 Horse and lough down the road. There’s hardly a movement on the water. It is so still that faint ripples seem to follow the beating wings of a sole bird as it flaps heavily down the length of the lough. The black currach’s don’t move, but their reflections seems to shimmer slightly as the bird passes. Two old men in thick yellow oilskins pass empty boxes down into a currach pulled up against the little breakwater. They don’t say anything and the only sound anywhere is the sound of the boxes landing. Otherwise the entire valley is silent. 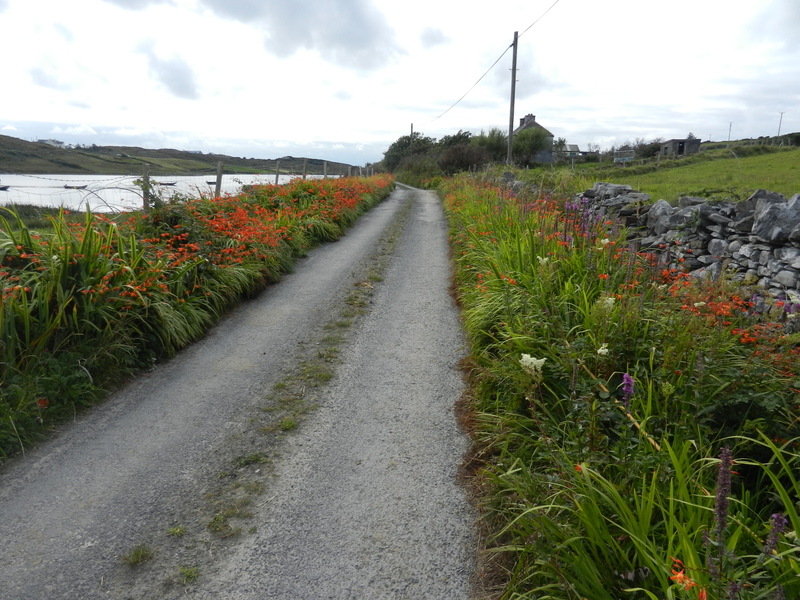 Wildflowers on the road to our Connemara house. Over on the hillside to the East a horse stands perfectly silhouetted against the skyline. I watch for a good few minutes and it doesn’t move an inch. Anywhere more urban and you might question whether it was a statue. Eventually it dips its head to eat a few mouthfuls of grass before resuming its pose. You don’t get the sense it’s watching anything. It’s just standing. The sky is grey with textured cloud. There’s just a hint of pink on the edges of some of them as the hidden sun comes up from wherever it has spent the night. Suddenly the fishermen start up the currach’s outboard and head round the corner for the open sea. The sound is shockingly loud and a couple of small black birds wheel into action like little fighter planes warning off the enemy. But almost the moment the fishermen pass the headland the sound disappears and everything returns to silence and, once the ripples fade, stillness. 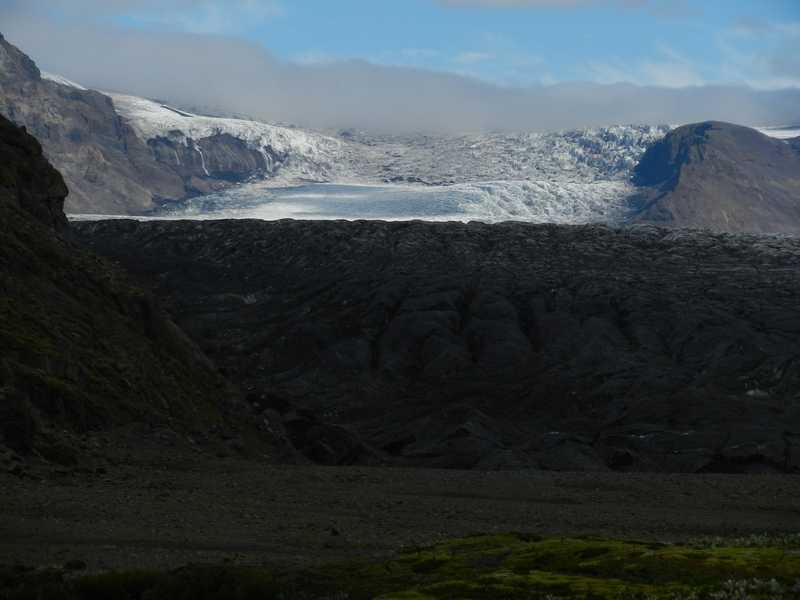 The Vatnajokull glacier is receding by about 150m every year at the moment. At Jokulsarlon the receding tongue has left a lake behind it and that lake is filled with icebergs. Yes, icebergs! So we went on a salamander ride through the icebergs. Being big fans of The Mysterious Benedict Society books we were pretty thrilled by the salamander-ride itself, but that experience paled beside the complete awesomeness of being amongst icebergs. We learnt that the blue ice has been recently under water while the white, and less tightly packed ice, has been exposed to the air. 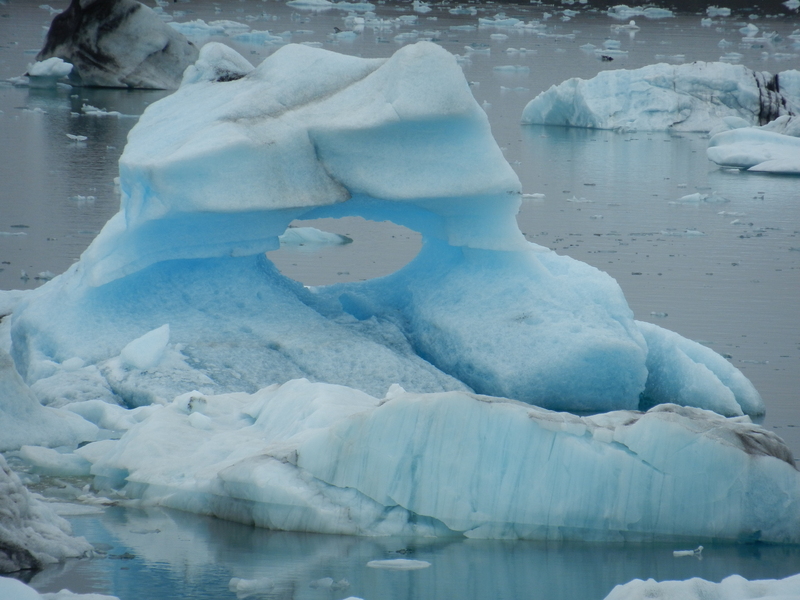 As the ice melts and the bergs flip the blue pats are exposed to the air. We touched and tasted berg ice that is about 1500 years old. The glacier itself is surrounded by a nimbus of reflected light even though it is currently a bit of a mucky colour. The surface of the glacier is covered with ash from the recent volcanic eruptions and this hasn’t yet been covered by snowfall. The bergs show strata of earlier eruptions with startling clarity – including a really thick band which we assume came form the eruption in the 1300s that dwarfed the Vesuvian eruption that swamped Pompeii and completely changed the face of Iceland. 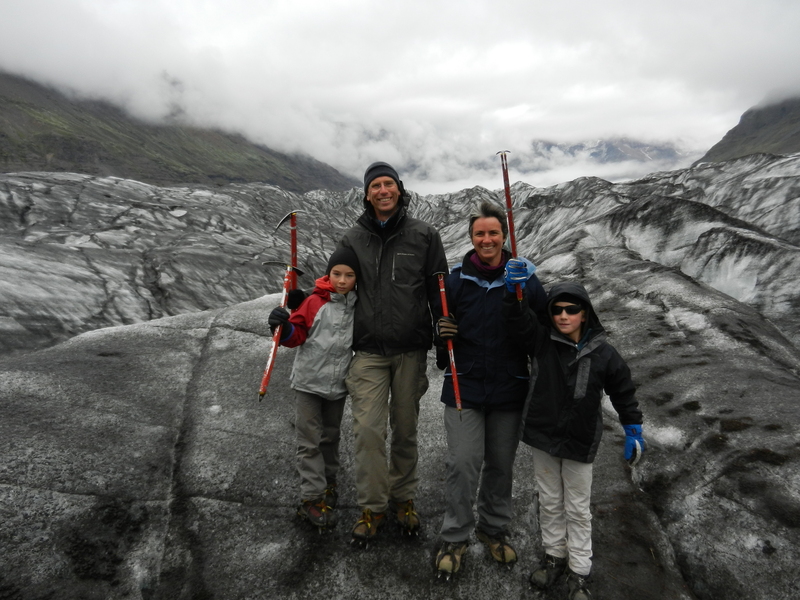 Walking on the Svinafellsjokull glacier. 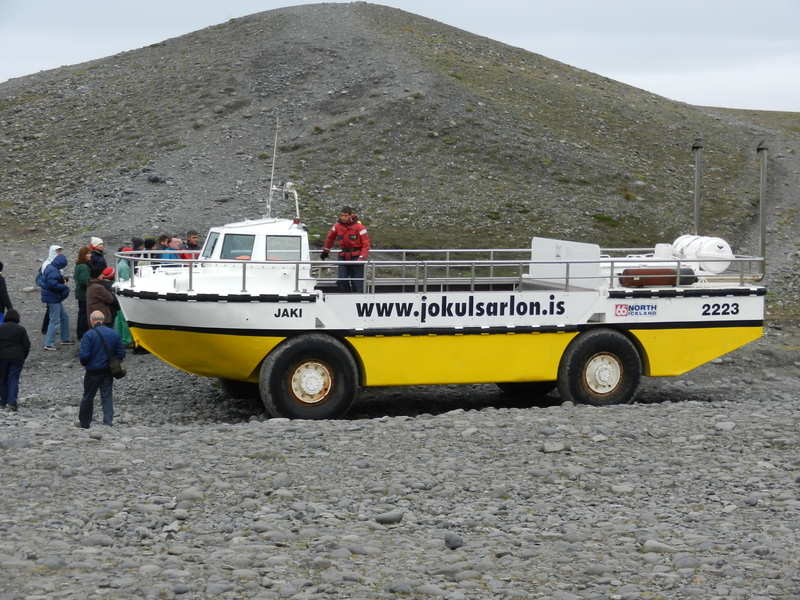 After lunch we went on the second part of our glacier adventures – a walk on the Svinafellsjokull glacier. 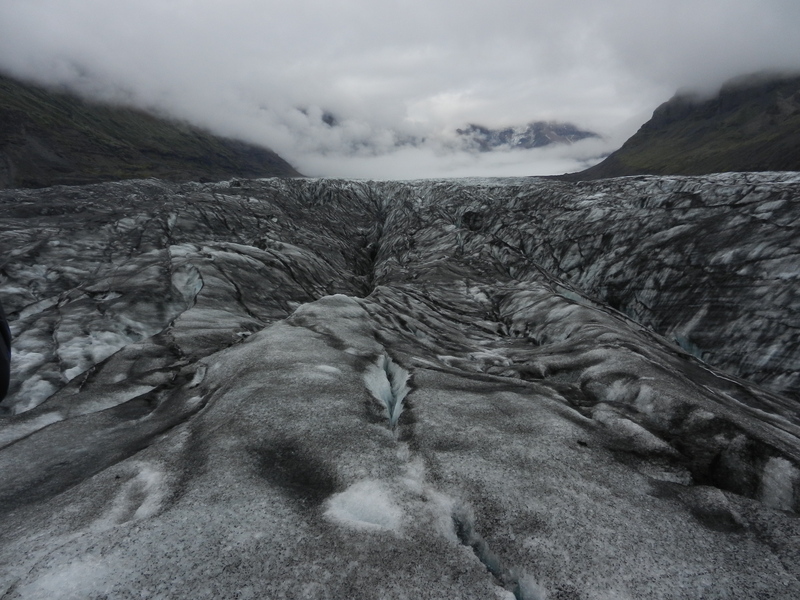 The first step was strapping on crampons and being issued with ice-axes; and then off we set over the glacier. The glacier was a wonderland of creases, crevasses, holes and bridges. Because of the eruption only a few months ago everything is coated in a layer of ash so it wasn’t a classic white walk but it was amazing nonetheless. At first we thought the walk was relatively tame. But after a bit of training in using our crampons – the duck walk, the old lady walk and the ballerina glide – we got more adventurous. We walked over some very scary ice bridges and ravines with drops of 90m to the side. We saw holes, we saw caves, we saw cones of mud formed as the liquid in ice holes freezes upwards. It was absolutely amazing. And all to the accompanying crunch of the crampons biting into the ice. The only other sound was the occasional roar from under-ice rivers – not mild trickling sounds but serious, rushing roars. The have a special word in Icelandic for ‘glacial melt flood’ and driving underneath the glacier you can see why. Huge boulder-strewn plains scoured flat by enormous force. 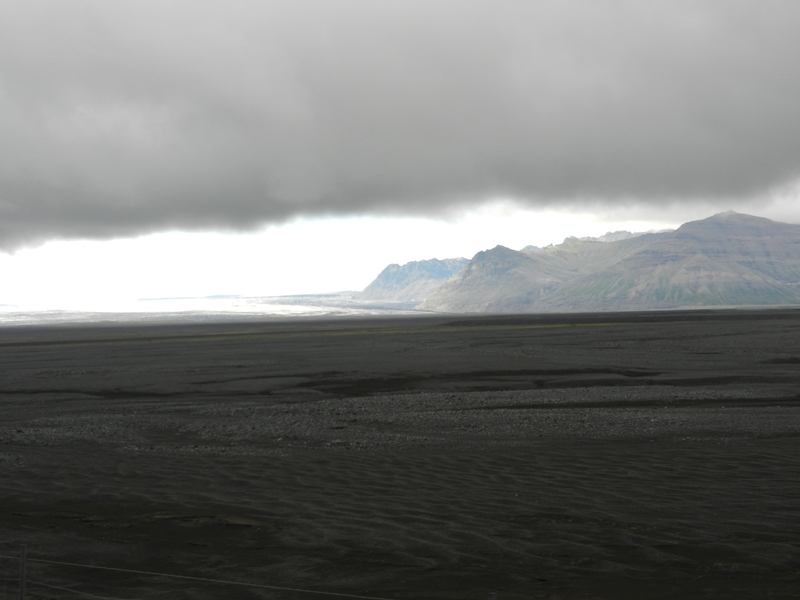 The sheer power was really driven home to us as we crossed the black sand desert – a simply endless black plain scoured clean of everything by glacial floods. It was a bit sad to think though that only a few tens of years ago the plain met the edge of the glacier and now the glacier sits a few kilometres back. It is completely sobering to realise that the glaciers are melting at such a rate that the ground is actually rising beneath them as it is relieved of the enormous weight of ice pressing down on it. Iceberg and salamander at Jokulsarlon. Ice cave on Svinafellsjokull glacier. If you think of Iceland as a clock-face, we started in Reykjavik at about 8 o’clock and travelled clockwise. We’ve gone over 1600km so far and are now at about 4 o’clock. The South-Eastern coast is a contrast to further North. It’s much calmer, with flat seas and rocky inlets. Even the birds seem quieter than their Northern cousins. We’re beginning to run out of words to describe all the beautiful places we’ve seen. And so far we’ve failed to add much in the way of Icelandic to our vocabulary. Icelandic is a strange combination of the incomprehensible and the almost familiar. The incomprehensible part comes from the fact that Icelandic has several letters that don’t appear in English. It also lacks the letter ‘z’ which was abolished in 1974. I do love the fact that they got together and decided to get rid of a letter which was not doing much good. The familiarity comes from a couple of places. Quite a few words are similar to English or German words, at least if you say them phonetically; although they’re not always used in quite the same way. ‘Hello’ is ‘Hallo’; ‘Good night’ is ‘Goda nott’. My favourite word in Icelandic is ‘goodbye’ which is simply ‘bless’. A lot of other words are similar to old English or to Scottish English: ‘Child’ is ‘barna’, ‘head’ is ‘heid’. So if you take a stab at saying something you can sometimes work it out. Othertimes you take a stab and end up with your tongue tied in an awkward knot. All of this, of course, is rather academic since everyone in Iceland speaks English. I drove round – they walked. Beynac-et-Cazenac is officially one of the most beautiful villages in France. The country maintains a list of such places, much like Australia has a list of tidy towns. 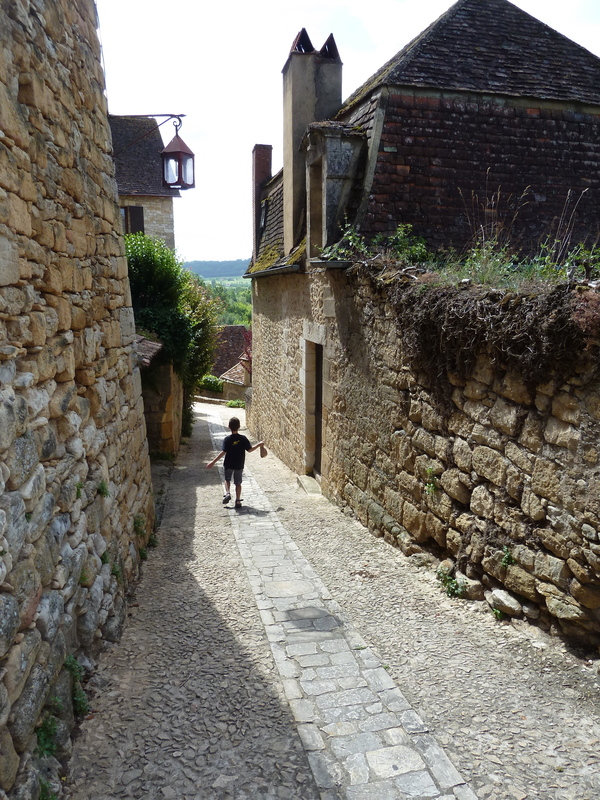 To make the list in France means the village really is stunningly pretty. The village’s toes dip into the Dordogne river as it meanders through green fields and forests. Its head is a thousand-year-old castle that once housed Richard the Lionheart and has featured in numerous movies thanks to its amazing preservation. In between is a village of golden sandstone houses and tiny cobbled streets that sprawls up the hill mirroring the caves that were the original settlements. 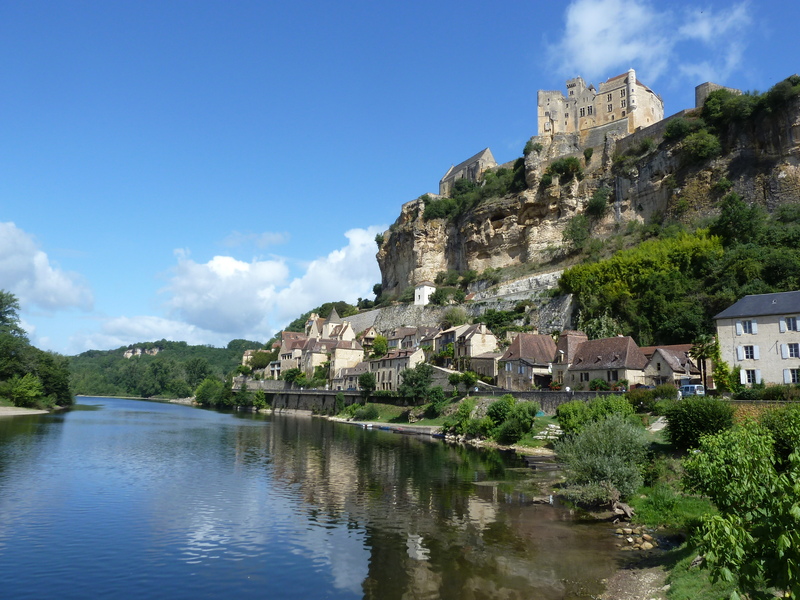 When we visited the amazing Roque de Saint Christophe yesterday we wondered what it would have been like if it hadn’t been destroyed in the 1500s – in many ways Beynac provides an answer to that question. There are castles and chateaux all around here – we can see several from our windows. The area was a major contributor to the crusades and then the front-line in the 100 years war between the French and English. The castles tended to fall through treachery, rather than force of arms, and are remarkably well-preserved. 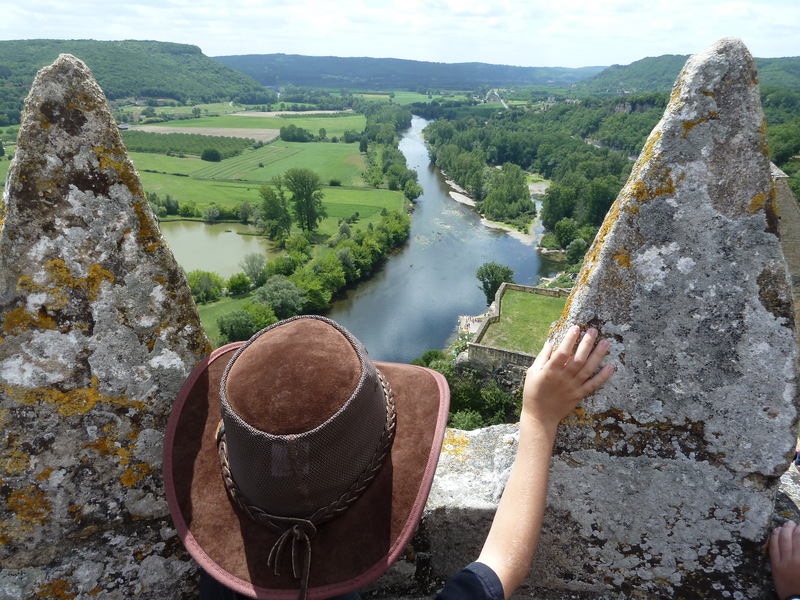 We explored Beynac castle this afternoon and agreed it’s one of the best we’ve been to. It’s a little like an interactive versin of some of the books we’ve read on how castles were built and developed: an almost perfect example of defensive architecture and great insight into how people lived back then. It even has the armour of one of the earliest Barons de Beynac – 900 years old and just chained to the wall for anyone to touch. We did, of course. Coming home with morning tea. Our house is half way up the hill up a tiny cobbled street that could only be driven by someone in a small, small car with no care for their paintwork and nerves of steel (we parked down by the river and carried our stuff up). We look out over the river and the surrounding valley through windows let into walls that are a couple of feet thick. At the other end of our street is a boulangerie with some great pastries and the usual wonderful bread. Men, all men, dressed entirely in black. From pointed hoods through capes to black boots. Like a negative view of a Klu Klux Klan meeting. All walking in silence. Some carrying crosses. Some flails. Some presenting plates holding knives, nails, fish like strange offerings. Men holding lanterns and candles casting a strange orange glow over the scene. And in the middle a group chanting in a low melody. 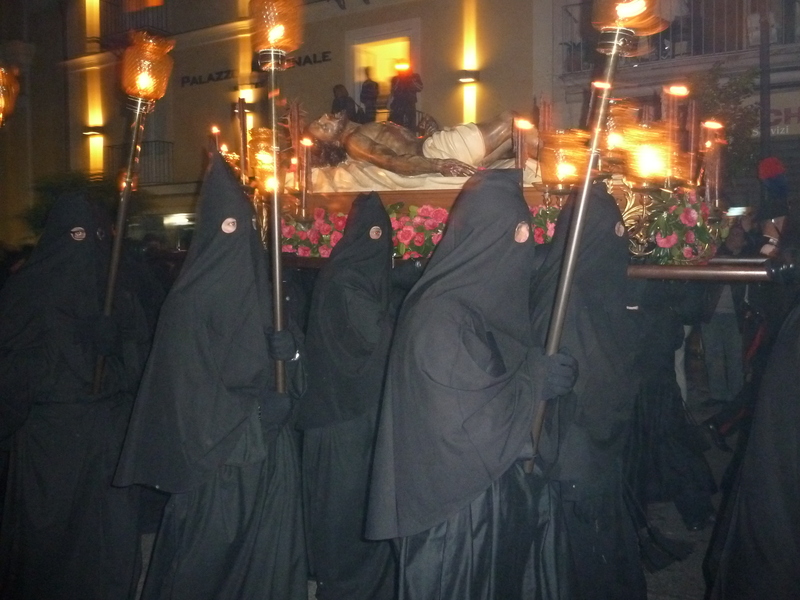 This was the Easter procession in Sorrento. It was like something out of medieval times; a combination of slightly scary and vastly impressive. One of the most stunning things was the silence – the crowd hardly murmured and the procession moved quietly apart from the leading band and the central plainsong. There are two Easter processions that book-end the day. We couldn’t face the 3am one in which the participants dress in white. The 8:30pm black one was easier to approach although harder to photograph. It really was an impressive sight and I’m so glad we saw it. As we were walking back, though, all I could think was: appearing veiled in public, they’d never be allowed to do this in France now.